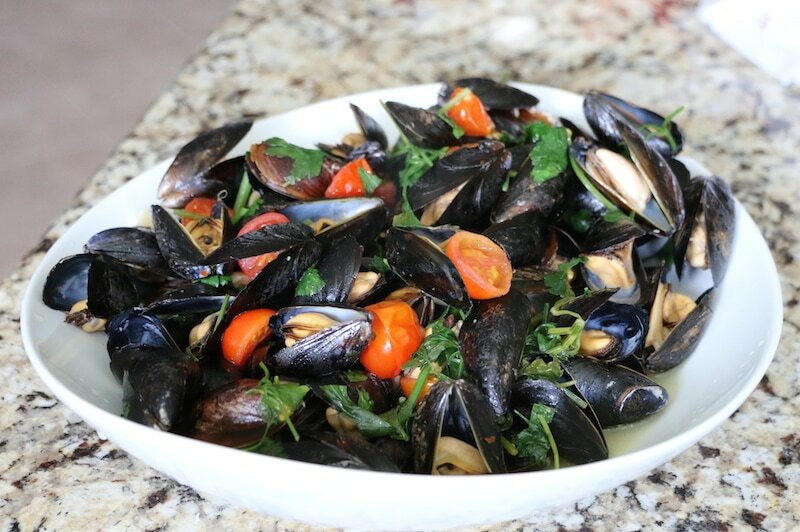 This mussels recipe with white wine is a fantastic dish to make for friends. We usually bring this one out while we are hosting during the holidays. Honestly, it’s an easy appetizer to make and it is really pretty to look at, right? Such a great presentation. The price is right as well. At my local supermarket, mussels cost around $1.99 a pound. If you order mussels with white wine at a restaurant, you will get charged somewhere around $13 in NYC though. So, seriously, you need to learn how to make this at home. 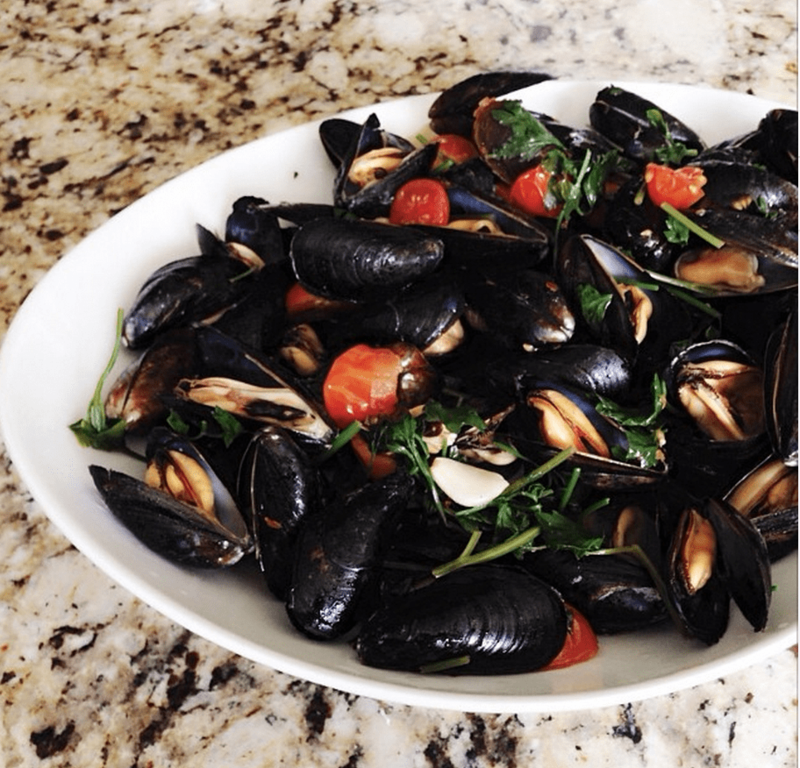 This mussels recipe with white wine will take you about ten minutes to prep and $10 to make. Check it out. I love to either serve this appetizer in a big white plate or the pan I cooked it in. You can have your guests pick right from your colorful pan or from a brand new clean plate. Either look works! Over medium heat, add olive oil and garlic to a large sauté pan and cook for a few minutes. Put in hot pepper flakes, salt and pepper, cherry tomatoes, wine and mussels. Then top with parsley. Place lid and allow to cook for 2 minutes. Stir. Cover again and continue to cook for 5-8 minutes or until all mussels are open. 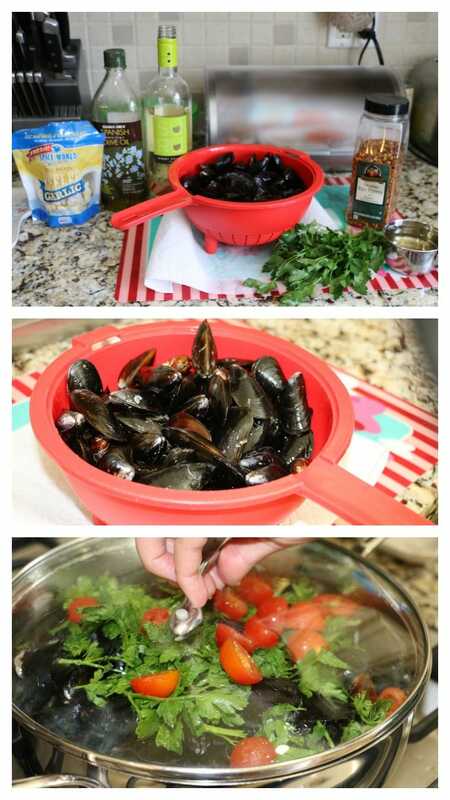 Discard any closed mussels. When in doubt… throw it out. Pour entire lot into an over-sized plate and serve. Have a hot loaf of bread? Perfect! Dip away. Enjoy. If there are any leftovers, cook some pasta the next day and toss all together. It just doesn’t get any better than this! For more of my recipes, click here. To see what Audrey posted for her ‘Getting Gorgeous in the Kitchen’ post, click here. Place lid and allow to cook for 2 minutes. Stir. Cover again and continue to cook for 5-8 minutes or until all mussels are open. 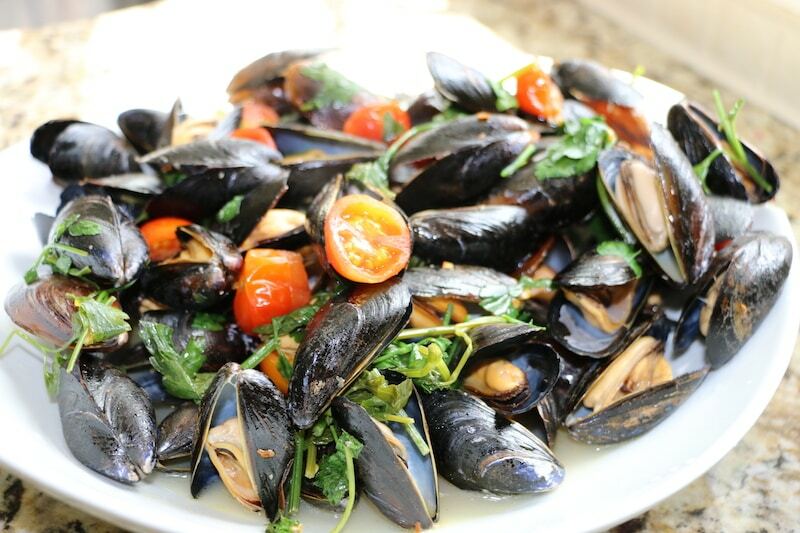 Discard any closed mussels. When in doubt... throw it out. Pour entire lot into an over-sized plate and serve. Have a hot loaf of bread? Perfect! Dip away. Enjoy. If there are any leftovers, cook some pasta the next day and toss all together. It just doesn't get any better than this! SOLD! I am totally doing this! This weekend. 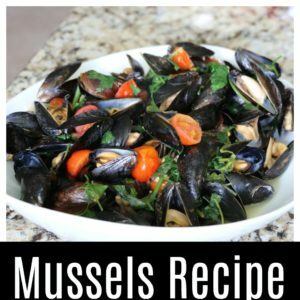 My 2 girls loooove mussels and the one time I tried to make them, they didn’t go so well. Totally pinning and sharing too. Thanks!